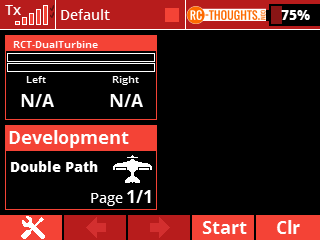 You have a plane with two turbines? 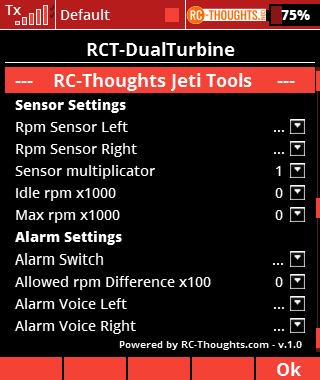 You need a easy monitoring for following rpm’s on both turbines at the same time? Here is one possibility for it! Made from a request from France, so here you are, s’il vouz plait! Rpm-sensors are self explanatory, just select the telemetry-sensor giving you their rpm. Sensor multiplicator is a setting for adding compatibility. Let’s say we have a turbine with rpm up to 230 000 rpm. Now the telemetry gives out values from 0 to 230 instead of 0 to 230 000, if this is the case select multiplicator of 1000. If your ECU-telemetry gives out correct value leave multiplicator to 1. Possible values are 1 and 1000. Next up is idle and max rpm-settings. These are among other things for the bar graph on telemetry screen in your main screen. Let’s say your turbine has a maximum rpm of 250 000 and idle at 30 000. Settings these values in setup means the bar graph shows you the range between 30 to 250 000. Next up is the alarm-settings. 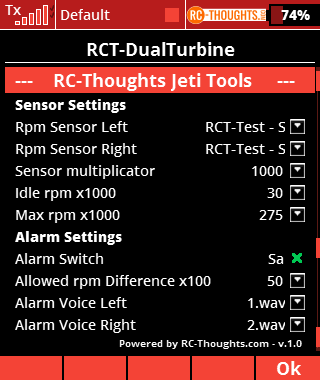 Alarm is made if one turbine rpm is lower than the other. First is the choice of switch. Alarms will function if this switch is activated. Advantage is that you can set the switch as the same for example as flight-mode, gear or anything that is active only when you are actually in the air. This way you will not generate any unnecessary alarms when starting or shutting down etc. Allowed rpm difference is the maximum allowed difference in two turbines rpm’s before alarm is generated. If you need to keep them within 1000 rpm set this to 10. Note the multiplicator of x100 here. Voice-files are self-explanatory. For example for left you could make your own file like “Left turbine low rpm”. 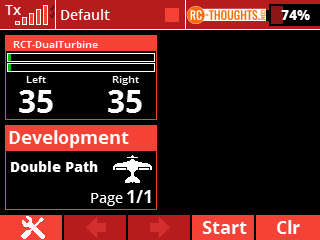 Go to “Main Menu” -> “Timers/Sensors” -> “Displayed Telemetry” and add “RCT DualTurbine” to your main screen. I have set up idle rpm to 30 000, max rpm to 275 000 and allowed difference to 5000 rpm. Lest see how it would look on your main screen. First picture above shows the screen when there is no signal from telemetry ie. plane is powered down. 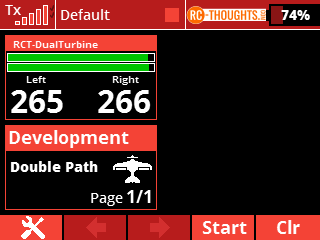 Second screen shows rpm’s as 0 since power is on but turbines are not running. First picture above shows a little high idle of 35 000 rpm on both turbines. The bar graph is just started since our idle rpm setting is on 30 000. Second picture has us in flight with 235 000 rpm on the left turbine and 233 000 rpm on right turbine. Since the difference is not over our max difference setting everything is green and normal. Here is a screen of what happens if one turbine’s rpm goes down. 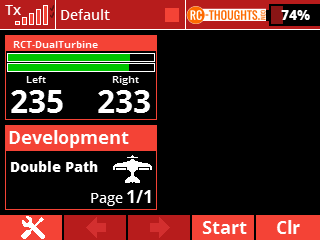 The lower turbines rpm-display and bar graph goes red, there’s also visual red arrow pointing to the turbine with lower rpm. 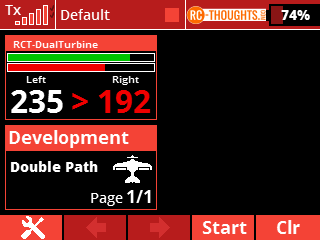 This is also the moment where voice-warning is played, in this case for the right turbine. Alarm is generated once. For the alarm to be possible to trigger again rpm’s need come back to rpm’s inside the max allowed difference-setting. That’s it. Quite simple but very informative! Always, always test the function thoroughly before flying!